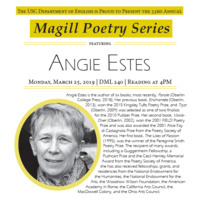 The Department of English is thrilled to welcome Angie Estes for our 33rd Annual Magill Poetry Series! Please join us on March 25th for the poetry reading in DML 240 at 4pm, which is free and open to the public. Angie Estes is the author of six books, most recently, Parole (Oberlin College Press, 2018). Her previous book, Enchantée (Oberlin, 2013), won the 2015 Kingsley Tufts Poetry Prize, and Tryst (Oberlin, 2009) was selected as one of two finalists for the 2010 Pulitzer Prize. Her second book, VoiceOver (Oberlin, 2002), won the 2001 FIELD Poetry Prize and was also awarded the 2001 Alice Fay di Castagnola Prize from the Poetry Society of America. Her first book, The Uses of Passion (1995), was the winner of the Peregrine Smith Poetry Prize. The recipient of many awards, including a Guggenheim Fellowship, a Pushcart Prize and the Cecil Hemley Memorial Award from the Poetry Society of America, she has also received fellowships, grants, and residencies from the National Endowment for the Humanities, the National Endowment for the Arts, the Woodrow Wilson Foundation, the American Academy in Rome, the California Arts Council, the MacDowell Colony, and the Ohio Arts Council.